You have your design picked out, now it’s time to decide on two things: board strength and board type. It’s hard to talk about packaging without knowing more about strength and board type (flutes). So, grab a cup of coffee and get comfy: we are going to go over the essential parts of corrugated material. Depending on the box size, you may need to choose your board strength. Board strength refers to the Edge Crush Test (ECT). This is a performance test and is related to the stacking strength of a carton. It is usually listed as an ECT value. If you are shipping a product that weighs between 25-40 pounds, a 32 ECT single-wall carton should be enough. You will need to use 44 ECT for anything over 40 pounds and up to 95 pounds. Corrugated cardboard is comprised of three layers: two linerboards sandwich a middle sheet that is in a wave-shaped pattern known as flutes. These flutes give strength and structure to boxes and serve as a protector, insulator, and cushion. Each flute size has a useful function, from shipping strength to reducing storage shape and improved printability. How Do You Know Which Flute to Choose? The E-flute is one of the most popular and smallest flutes. It has a flat surface which makes it ideal for high-quality printing. It has a very thin profile thus reduces outer box dimensions and can help save on storage space. It also provides the best crush resistance making it a good choice for glass, delicate items and more. The B-flute is a good alternative to the E-flute when packaging heavier items. With a thickness of 1/8’ and shorter flutes, this type of box provides a rigid, flat surface for printing. This is the type you often see in retail stores. 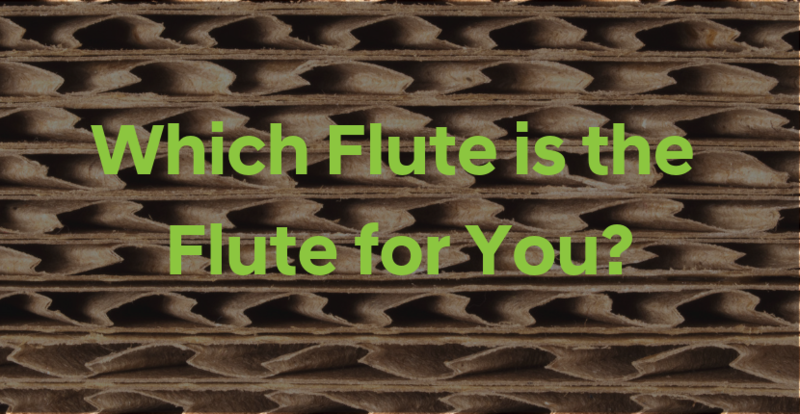 The C-flute is used for shippers and has a thickness of 3/16’. It’s the most widely used box. These flutes are taller, giving C-flutes more cushioning than B-flutes. You will be able to pack heavier items due to its crushing resistance and stacking strength. As you can see, things can get a little complicated when it comes to different flutes. Our team will help you determine the right board strength and type for your corrugated cardboard needs!